When Nitin Gadkari rolled up his sleeves in 2014 to get down to building world class highways, he found inspiration in John F Kennedy’s quote that “American roads are not good because America is rich, but America is rich because American roads are good.” That quotation, framed, hangs on the wall of his fifth floor office at Transport Bhawan in the capital. Since taking charge of the Road Transport and Highways Ministry, how has the MP from Nagpur fared? The answer seems to be ‘not too bad’. Compared to the tenure of the three road ministers in the second term of the UPA government who preceded him — Oscar Fernandes, C P Joshi and Kamal Nath — Gadkari’s performance is a shade better. The official statistics show that the total length of highways stood at 130,000 km in September 2018, up from 97,300 km when the BJP came to power. The pace of road construction in 2017-18 grew to 28 km daily or 70 per cent of Gadkari’s target of 41 km, largely on account of timely clearances. According to official data, the construction pace was sustained during the first quarter of 2018-19 when it hovered around 26 km. Perhaps Gadkari’s prior experience helped. He executed the Mumbai-Pune Expressway in his capacity as the PWD minister in the Maharashtra government from 1996-1999. 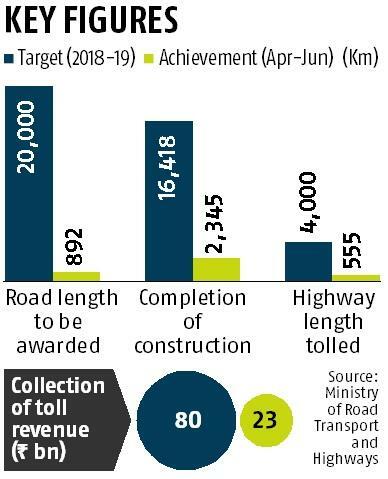 Whatever it was, the National Highways Authority of India will this year witness the highest ever growth out of the last decade ((FY2010- FY2019) on execution, said credit rating agency ICRA in a recent report. The majority of the NHAI projects which have been awarded in the past three years are on track and have not encountered any land acquisition challenges, added the report. “Typically, the physical progress in the first 12 months, post the construction start date, ranges between 20-25 per cent and the execution peaks thereafter in the second year in the range of 50-75 per cent, with the balance execution in the third year, depending on the construction period and the complexity or scope of a particular project,” said Shubham Jain, vice-president & group head, corporate ratings, ICRA. The notion of setting daily construction targets has to be credited to Nath, who is now Madhya Pradesh chief minister. Nath’s own target was to build 20 km a day. He failed. Around 6-8 km of highways were built every day during his tenure. Joshi kept the same daily target of 20 km but managed only 10-12 km. Fernandes, who followed, managed to get this up to 17 km a day when he held the portfolio for less than a year from 2013 to 2014. “The sector’s performance was messed up with aggressive bidding by private sector companies, delays in land acquisition on the part of NHAI and banks not doing proper due diligence. In 2015, only about 1-2 companies were financially stable and others were bleeding. This scenario improved as now there are about 15-odd companies which are doing well,” said Kushal Kumar Singh, partner, Deloitte India. The revival happened after the introduction of the hybrid-annuity model under which the government pumps in 40 per cent equity in the project and the remaining amount has to be arranged by the concessionaire. 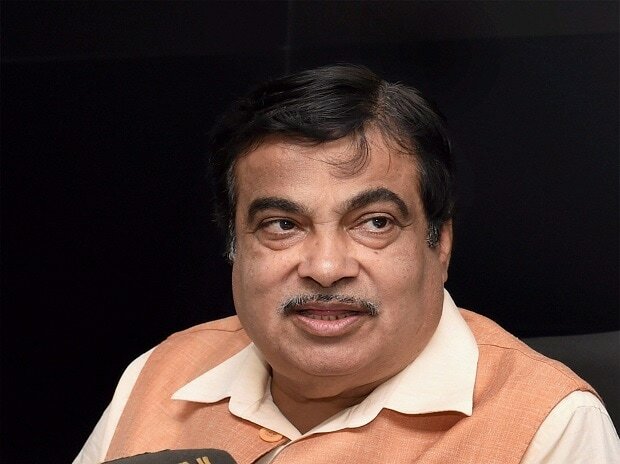 Gadkari was also successful in ironing out some of the issues in the sector, for example, the introduction of the quadricycle, which had been planned in 2013 but was delayed over concerns raised by some auto companies such as Tata Motors, TVS, and Maruti Suzuki. On November 23, Gadkari notified the insertion of the item ‘quadricycle' as a 'non-transport' vehicle under the Motor Vehicles Act 1988. Till then, quadricycle vehicles were only allowed for transport under the Act but the notification will now allow them to be used as a non-transport or passenger vehicles a view to providing a safe and cheap mode for last mile connectivity. One area where Gadkarii has had less success is reducing the daily carnage on Indian roads. Three persons died every ten minutes in road accidents across India in 2017. In terms of road categories, the national highways accounted for 30.4 per cent of total road accidents and 36 per cent of deaths in 2017. Accidents on state highways and other roads constituted 25 per cent and 44.6 per cent respectively. The Motor Vehicles Bill 2016 was meant to update the 1988 Act by reducing accidents and fatalities by 50 per cent. It provides for heavier penalties for traffic violations, ranging from Rs 500 to Rs 1 lakh, rationalising third-party insurance, holding parents accountable for juvenile drivers’ actions, and setting out clear liability norms for automotive producers in the case of vehicle defects. But Gadkari has been unable to forge a consensus in Parliament and the bill continues to hang fire. Sources say the key stumbling block is opposition from state governments who fear the bill will dilute their powers. Gadkari has himself admitted that his biggest failure as India’s roads minister has been his inability to curb this loss of life.